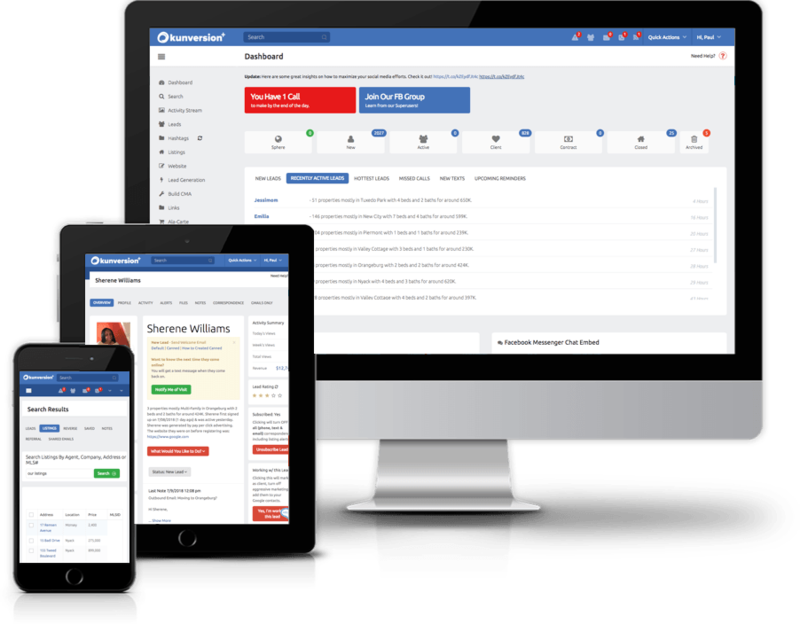 The #1 Lead-Gen Platform for Top Producing Teams and Agents Just Got Better. 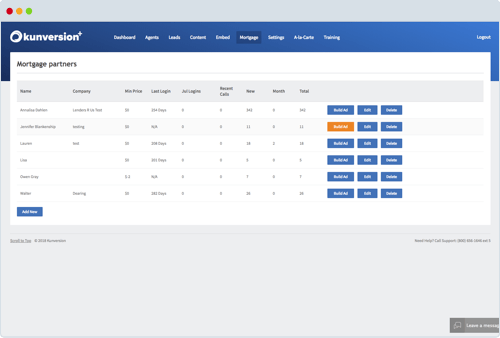 The most powerful lead acquisition and relationship manager solution for top producing teams and agents JUST GOT BETTER. 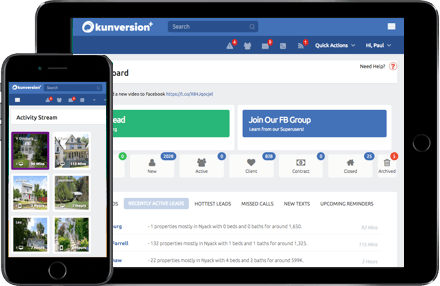 The original Kunversion platform is trusted by over 40,000 real estate professionals across the US and Canada and captures over 500,000 buyer and seller leads per month. With the new Kunversion+, your team can drive more business than ever before! Since 2011, Kunversion+ plus has been the industry leader in IDX websites, lead generation, & automated follow up. We have helped top producing agents and teams generate millions of leads and close thousands of deals. The new Kunversion+ is packed with even more tools and features to help agents and teams thrive. Kunversion+ offers multiple modern responsive themes with powerful customization features. We have 99% USA & Canadian IDX coverage. Put your best foot forward, and make every listing look brilliant. 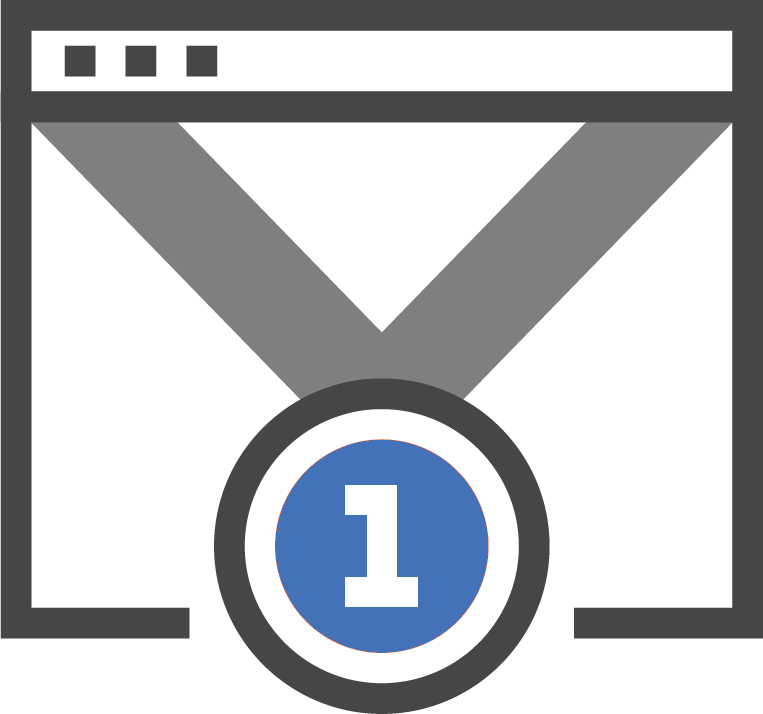 It’s literally in our name, Kunversion+ is designed to have industry leading click to lead conversions. We also give you the ability to build stand alone squeeze pages for all your advertising needs. 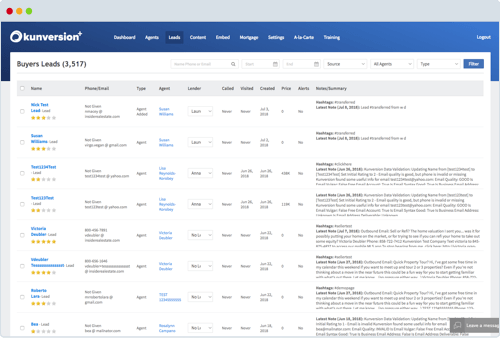 With 22 lead-gen tools available at your team’s fingertips, finding quality leads (both buyer and seller) has never been easier. Follow up with your leads in both a desktop & mobile CRM. Our easy to use modern interface allows you to interact with your leads in a way ANY agent can learn quickly. 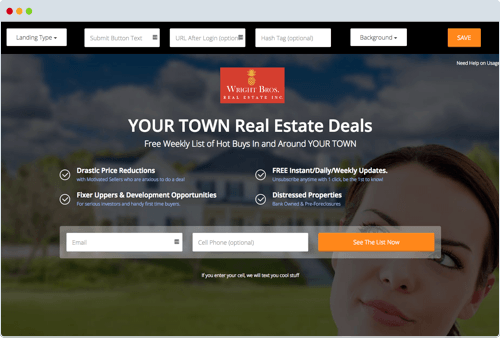 Take advantage of pre-built smart campaigns, real-time property search alerts, mass emailing/texting and more. Powerful behavioral automation that drives 10X the Results. We know you and your team are busy. 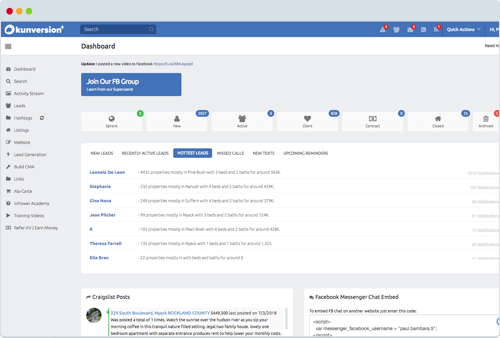 Our system is designed to automatically communicate with your leads based on their activity and behavior, so that you won’t ever miss a beat. Email, text, print & phone all are automated to make sure you have the highest possibility of converting your leads to sales. Get 10X higher response from leads with Kunversion+’s Behavioral Automation System. 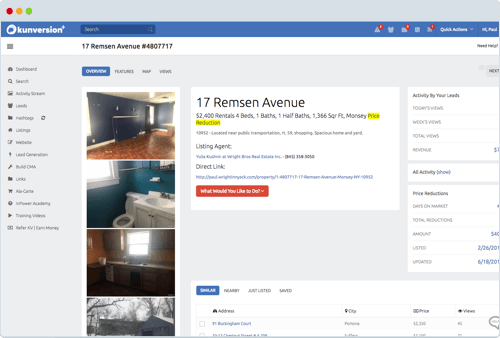 Our unique Listing tools allow you to work with listings in much the same way as leads from the back end of your system. 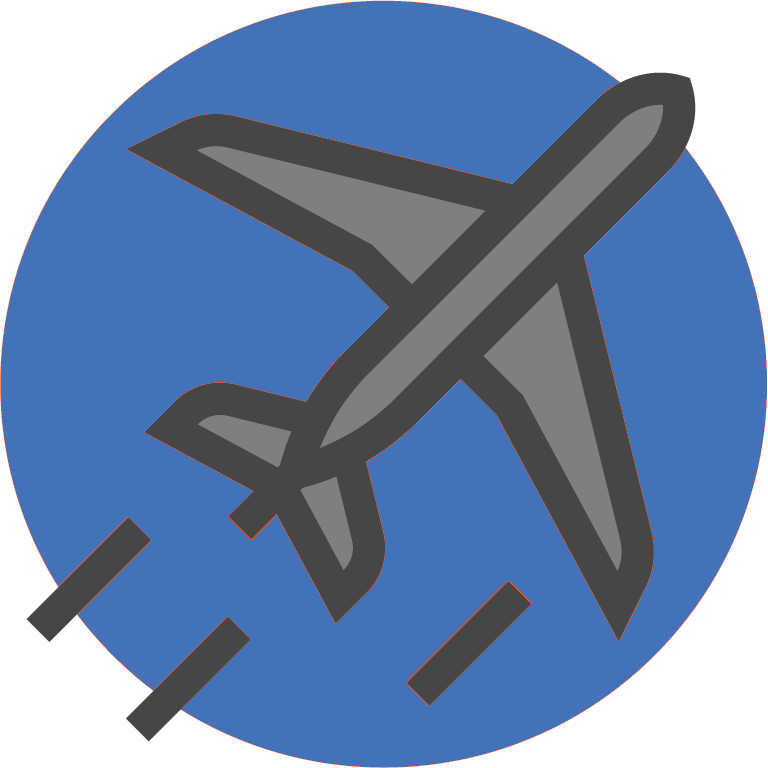 This ensures your team doesn’t waste valuable time bouncing between your CRM and the MLS – or worse lose clients to a poor MLS experience. 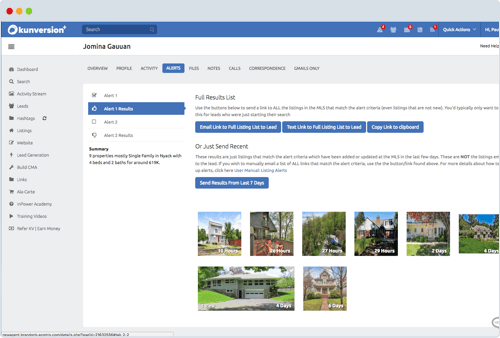 We automatically pull all your listings from the MLS & give you the ability to market them, share them, and even view activity on them right from the back end of your system. Kunversion+ takes mobile to a whole new level. 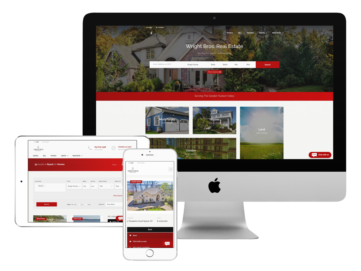 We have both a fully native agent CRM app to manage your leads on the go; as well as a cunsumer-facing mobile app for you to share with your clients for mobile homesearch. Drive maximum conversion and Have full control over the leads you generate for you team, control routing, control access, all while having full visibility into your pipeline & who is killing it and who needs help. 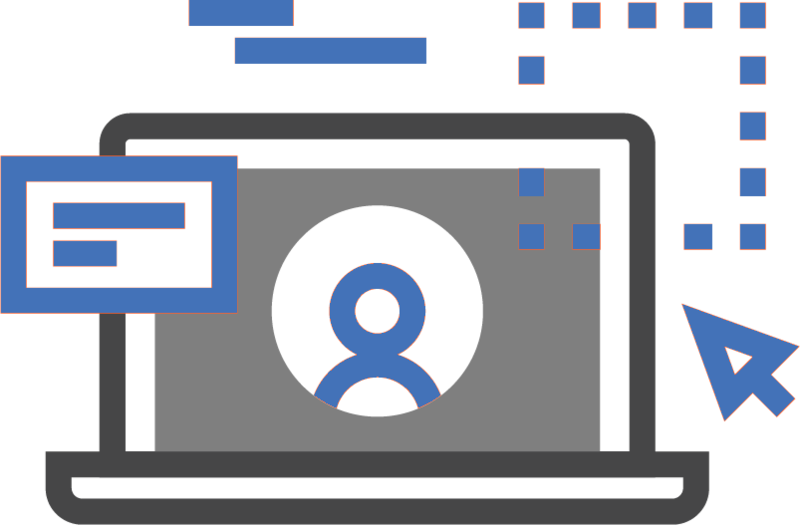 Kunversion+ offers unique tools for teams to manage their business better than ever before, including a team dashboard, accountability settings, reports and more. Partner with your favorite lender to help offset system costs as well as assist in the lead follow up process. We provide your lender with a full CRM in which they can interact with you and your agents, becoming an integral part of your lead-gen team! As a team leader, your job is to be the rainmaker. You need to not only keep your agents fed with a consistent flow of high-quality leads, but make sure they’re closing them as well. The best system will help you drive lead-generation, automate engagement and multiply closings. See why Kunversion is the #1 choice for successful teams. Your team needs to be constantly driving new business. This includes business from free sources, like social media, as well as paid sources, like Google and Facebook ads. Additionally, you want to bring all leads from all sources together effortlessly with Lead Sync. 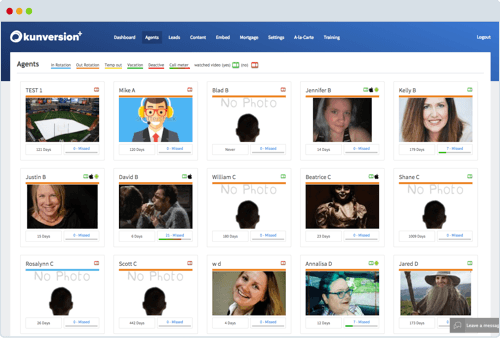 Kunversion+ gives you the most simple, most powerful set of tools available to drive and manage leads all in one place. Your most productive employee is the one working night and day to keep you organized, informed, and working at the top of your game. The Team CRM receives, distributes, rates, and qualifies leads. It takes your Sphere of Influence and powers it up. It helps you prioritize what you’ll work on next, and even gives you scripts to use in a pinch. Time to become the best version of you. Our Marketing Autopilot features embrace Artificial Intelligence features like behavioral lead response text messaging, Smart Campaigns & Queing up phone calls to the CallQ Mobile Dialer. The result is fast, responsive automation that drives leads to become clients. You have everything from open houses and showings to paperwork and closings. You don’t have time to babysit your laptop. 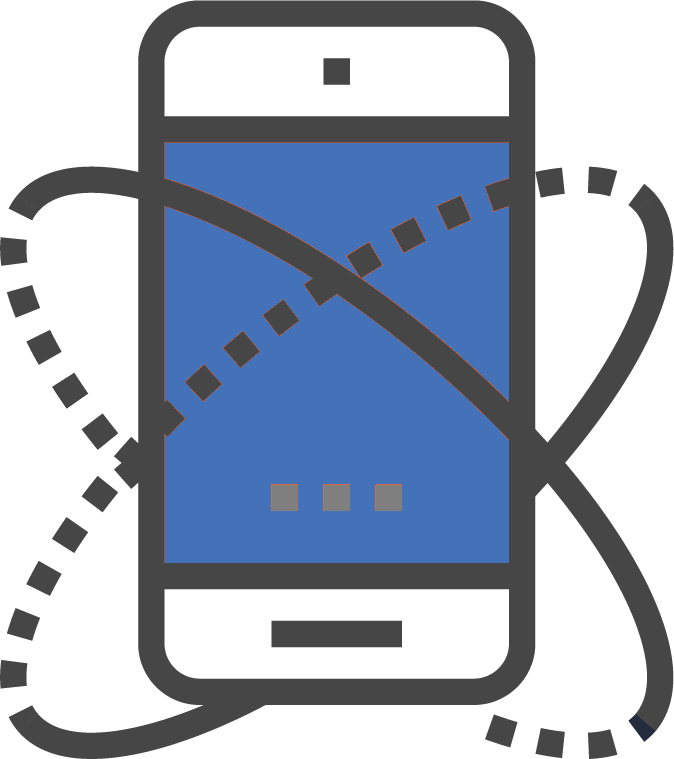 The CallQ Mobile Dialer gives you a personalize dialer with calls served up automatically to you every day based on the leads and contacts most important for you to call today. You can also use it to reach out to groups of leads from your hashtags or any other set of people. Hit go, and talk on bluetooth while you run around town. We get it, you’re balancing a lot, so your tech needs to be mobile with you. Try it out, and you’ll never go back. "The Smart CRM is so smart. It watches people interacting on the website and then texts and emails them and it makes me look really tuned in. It gets them engaged. It does more than get leads. It converts leads." At the end of the day, real estate is about connecting with clients, and whoever connects first, wins. Kunversion calls me up immediately and calls over and over until I follow through. It keeps me accountable to make sure I connect first. Agents can put in the effort, build and place squeeze pages, and be rewarded for their efforts. Regardless of capital, it is duplicatable. They just have to put in the work. Being able to use text messaging as part of a drip campaign is huge and there isn’t anybody else in the space that offers that. Some companies will let you send one initial text, but the ability to mass text or incorporate it into your drip campaign? It just isn’t really out there. Ready to See Kunversion+ in Action?